New Generations Birthing Center brings patients the latest and best in family-centered maternity, providing parents-to-be with complete labor, delivery, and recovery services all in one home-like environment. One of the most thrilling and gratifying experiences in your life will be the birth of your child. From your first contraction to the magical moment when your baby takes that first breath, your physician, anesthesiologist, and nurses will help make this event as pleasant and safe as possible. When you feel labor has begun, contact your doctor. Your physician will assess your condition and let you know if it is time for you to head to the hospital. Upon arrival to the hospital, use the Main entrance and register. After registration, you will be escorted to one of our labor and delivery rooms on the second floor. Once in your room, you will be asked to change in to a hospital gown. A nurse will then ask you for some information to begin your patient file, and will start an intravenous drip, draw blood and request urine for routine lab tests. They will also attach a fetal monitor to your abdomen to measure your contractions and your baby's heartbeat. Fathers/coaches are encouraged to stay with you throughout the birthing process. As long as you and baby are healthy, you will be encouraged to move around during labor. Changing your position frequently, such as walking, rocking in a rocking chair, or turning from side to side, will help with your comfort. The degree of labor pain depends on factors such as the level of pain tolerance, size and position of the baby, strength of uterine contractions, and prior birth experiences. Anesthesia is provided based on the patient's wishes and her physician's recommendations. Natural Childbirth, in which no anesthesia is used. General Anesthesia (usually reserved for emergency deliveries), in which you remain unconscious through the surgical delivery. Local Anesthesia is injected to numb your perineal area in preparation for delivery. Regional Anesthesia, epidural, and spinal block is injected into the space around the lower spinal cord. You remain awake, conscious, pain free, and may stay actively involved during the delivery process. A spinal block is most commonly used for delivery by cesarean section or when the use of forceps is necessary. Read more on Woodlawn Hospital's anesthesia services. Sometimes, if labor hasn't started on its own, a doctor may induce labor. This can occur, for example, when you are 41-42 weeks gestation, if your cervix is ready for labor, or if continuing the pregnancy could be harmful to you or your baby. There are many reasons why the decision may be made to perform a cesarean section. Sometimes, the cesarean is planned in advance because of an existing medical condition, or labor fails to progress and there is some concern about the health of the baby or mother. Recovery from a cesarean section will take longer than a regular birth and patients stay in the hospital a few extra days. However, women who have had cesarean sections will generally be up and out of bed within 24 hours, with the help of their nurse, and are encouraged to walk and move around. Once your baby is born, you will have the opportunity to recover while our skilled team examines your baby to make sure he/she is completely healthy. Following this period of respite, you are transferred to one of Woodlawn Hospital's postpartum rooms, where you will enjoy our specialized approach to mother and infant care. We encourage you to keep your new baby in your room as often as you wish so you can spend time bonding with each other. When you need to rest or prefer some time alone, our trained nursing staff is available 24-hours a day to provide care in our secure newborn nursery. Several tests will be administered to your baby before leaving the hospital. Newborn screening is a way to identify babies who are at risk for serious disorders that are not visible at birth. Indiana State law requires that all babies in Indiana be tested for certain inherited disorders including, sickle cell anemia, phenylketonuria, hypothyroidism, and galactosemia. A few drops of blood from your baby's heel will be sent to be screened. An infant hearing screening is also completed on all babies. Before it's time to take your little one home, a nurse will talk with you about a variety of infant care issues, such as feeding, bathing, infant safety, umbilical cord care, and circumcision care. Our staff will also help you take care of those many important details such as getting your newborn's birth certificate and social security number. We ask that you have a car seat for your baby to ride in when you leave the hospital. You should have an infant car seat installed and checked for safety prior to transporting your baby. Certified Lactation Consultant services are available for breastfeeding mothers. Call Sandy Crissinger, RN, CLC, for questions at (574) 224-1250. 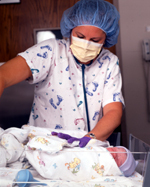 To make arrangements to tour our New Generations Birthing Center or for questions concerning, call (574) 224-1250.